The following graph uses a list with 201 elements. Can you recreate it? Loved this graph and since I hardly used cubics I thought I would try and recreate this one. Unfortunately for me, I forgot completely how to make this graph. The closest I could get was just a stretched out version of the parent graph, so it has the same fade effect but it is not above the x-axis. This graph was interesting to me because it doesn’t look like a normal graph, and it looks kind of like a vortex. I knew it was a cubic graph because it had two curves. 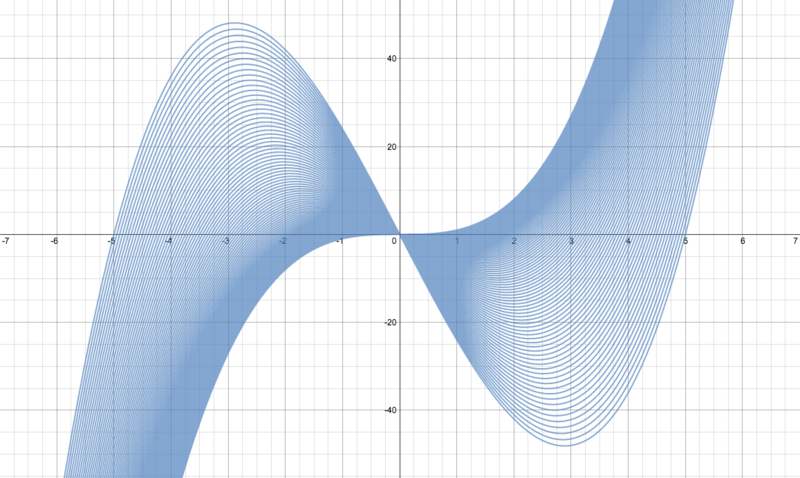 I changed the slope of the graph, and obtained the two curves. However, I couldn’t get the graph to go above the x axis, like Chris. I tried to shift the equation, but that only moved the whole line up. Since this graph uses a list, I guessed that this graph is basically a collection of a whole lot of cubic graphs. There seems to be three x-intercepts for each cubic graph, and one of those x-intercepts looks like x = 0 since that’s where all of the lines get scrunched up. I looked at the outermost graph. The other two x-intercepts are -5 and 5, so the equation for the outermost cubic could be y = (x-0)(x+5)(x-5). So the x-intercepts are probably using the list. I made eq.1 the template equation and eq.2 with the list. 201 elements in the list? That could be 100 for x>0, 100 for x<0, and 1 at x=0. 5/100=1/20, so I did the list in increments of 0.5.